It measures 40″ x 30″. Its the first time I’ve worked larger than 24″ x 18″ using the encaustic and organza process. Written down, it doesn’t sound too big. But it is. I’m happy with how the art is holding up at this size. After first applying the four layers of organza with encaustic, I noticed a uniform quilt-like pattern throughout the surface. I realized that this was from how I painted on the encaustic. At first I liked it. But it began getting on my nerves. The uniformity of the pattern was taking away from the image. So I tried smoothing things out by laying the art horizontally and putting 200 watt lamps up to it. This did a decent job. But you’ll notice that there’s a faint yellowing around the figure’s edges. Apparently organza doesn’t like sustained heat. Also, the lamps left distracting circular patterns in the wax. I put the work up vertically and began blasting it with my heat gun. 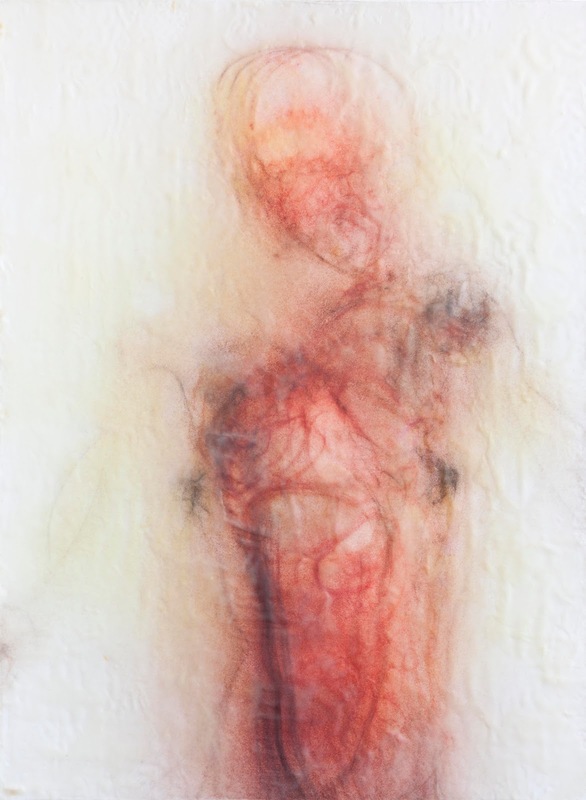 This created drips and rivulets as the encaustic seeped up from behind the four layers of organza. I knew this wasn’t something I would like. But I was enjoying the process, so I just let myself have some fun. After about a half hour of doing this I stepped back to take a look and promptly threw up in my mouth. So I put her horizontal again and began melting down the drips with my heat gun. After doing this it all just looked like a fat globby indistinct mess. I had an urge to take a hammer to the piece. Or throw paint at it. Something. I went back to it a few hours later and decided to apply one final coat of encaustic and do my best at evening it out with the heat gun. After it cooled down I buffed the surface. I’m relatively happy with the imperfections of the surface now. I’m intrigued with the yellow cast that the lamps gave the work. That said, I want to make a larger piece with a more uniform surface. And this gets much more difficult as I work larger. The larger I work, the greater the heat differentials I have to deal with. And going back and forth from hot to cold doesn’t make the encaustic and fabric mixture I’m using too happy.